Milesplit put up unofficial start lists. By my count 50 in D1 and 63 in D2. This may final be the year doomsday predictions of outgrowing this meet will happen. Definitely concerned about size of field on that course. Hope I’m wrong. At least they are outlawing cookouts…and dogs…both troubling with so many people around (and I am a dog lover). Too bad on the dogs, but at least they have Nausea in Div. II? 2015 entries listed here as totaling 3246.
i might have the wrong pdf file, admittedly. 2477 runners completed races in 2015. 2585 runners completed races in 2014. Thanks. 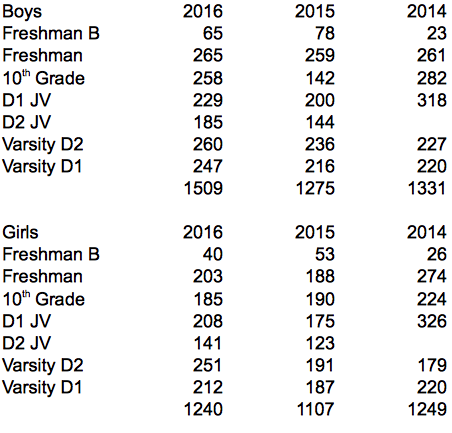 My numbers were calculated from the MSTCA website. Any known changes to the course this year? No, but a small section behind the barn has been paved, making spikes a tenuous proposition. I’m not trying to be a dink, just trying to understand how this year’s times relate to years past: was the course changed? Same as last year? The course appeared to be the same as last year and the times were comparable to those of last year. Very impressive times here, Claire Martin seems like a lock for the All-State title already.Hard to tell with the current team race, but Hopkinton certainly put up a strong performance. 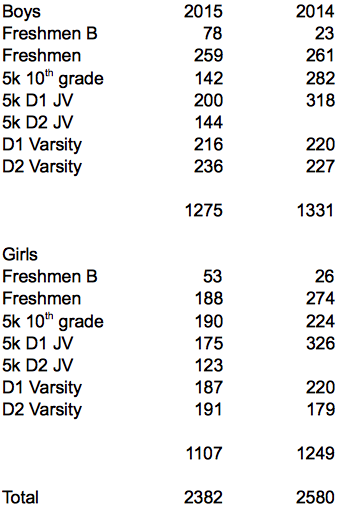 The girls D2 race was phenomenal, the Milton girls are a head above the rest, 4 sub 19 and 5&6 under 20 is incredible. Boys races were amazing as well, Wellesely looked phenomenal, especially if you count their 1-2 performance in the JV race. I think that Lowell is the only team that could conceivably take them down. Of course (I could be mistaken) St. Johns is in the central region right, meaning they’ll have an extra chance to practice at Gardner ? Despite Kovac’s performance, I think Rocha will still wrap up the all state title. Great meet to those all involved, well done by Saucony, Marathon Sports and MSTCA. They all do it best for the athletes, spectators and certainly a pumped atmosphere for XC. It was to watch! Same course but 100 meters of pavement x3 loops meant many didn’t wear spikes. My kids didn’t and I’m curious if any coaches kids did and how they felt during and afterwards. footing there is generally good but I can’t help but wonder if it could slow some kids down a smidge. Anyone have video of the Boys D1 finish? Curios to see the hurdling technique I’ve been told about.